Anthony Mundine has declared his interim World Boxing Association light middleweight title bout with Mexico's Rigoberto Alvarez as the most important of his career, with time running out on his plans to take on the world's best boxers. Mundine (42-4, 25 KOs) still has aspirations to take his show on the road and face the best boxers Europe and America have to offer. However, in order for any of that to happen, he knows he needs to stop the crafty southpaw in Newcastle tonight. ''This could be the biggest fight of my career,'' Mundine said yesterday. The fight is being televised in Mexico, giving Mundine a worldwide audience to promote himself and help him land a big overseas payday. ''It will mean the masses start to see my talents,'' he said. ''After this fight I want to fight the best, and I don't care where the best are - America, Europeans, it doesn't matter. At 36, Mundine is aware that goal will start to slip away from him if he doesn't find a way to stop the 33-year-old Alvarez. It's why the former rugby league star has changed his training and dietary regimens to ensure he maintains his strength despite dropping down to the light middleweight division. ''I found it easier to make weight than last time,'' said Mundine, who weighed in at 69.6kg. Mundine ranks Alvarez (27-3, 20 KOs) among the toughest fighters he's stepped into the ring with, arguing his opponent is unlike most Mexican fighters, who have a reputation for enjoying the brawling side of fights. 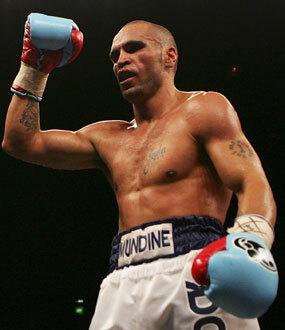 But despite whatever challenges there are, as always, Mundine is adamant he has the artillery to finish the fight. ''He's a very formidable opponent, he's going to be a hard fight and a big test,'' Mundine said.